Chinese New Year, also known as the Spring Festival or Lunar New Year, is the most anticipated and celebrated festival in the Chinese calendar, but for businesses this can often be a disruptive time that requires advance planning and strategizing. The celebrations officially culminate on the 15th day of the festivities, with an event known as the Lantern Festival. However, normal business will typically resume by day eight – an auspicious number in Chinese culture. 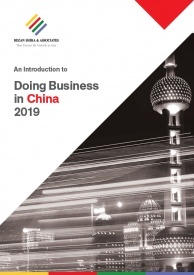 As China’s influence on the international stage grows in prominence, the festival now has an ever-larger effect internationally – particularly for those doing business in, or with, China. It is therefore imperative to be aware of the effects of what is essentially a nationwide shutdown, particularly with regards to making orders and payments, supply chains, and business travel. Chinese New Year is predicated on the ideas of ‘reunion’ and ‘togetherness.’ These core ideas trigger one of the largest human migrations in the world, as hundreds of millions of people stop working and suddenly flood China’s roads and public transportation networks to make their journey back to their hometowns to bring in the New Year with their families. According to the 2019 CNY Prediction Report produced by Ctrip, China’s largest online travel agency, it is expected that there will be more than 400 million trips made throughout this CNY period, with approximately 7 million of those being international outbound trips. As a major entry and exit point for workers and travelers, China’s first-tier cities like Shanghai and Beijing will experience mass floods of migration. These cities are heavily populated by workers from different provinces who will look to travel home during this period; they are also favored by domestic and international travelers and experience a surge of inbound tourism – especially between the third and fifth day of the CNY festival. Shanghai, in particular, has grown in popularity since the introduction of the 144-hour visa policy, as many international travelers now opt to travel there to take advantage of this visa. The city is ranked at ninth for 2019 CNY’s popular domestic travel destinations with an average spending of RMB 2,571 (US$383) per person for group tours, according to Ctrip’s CNY Prediction Report. In light of China’s travel trends, it is generally best to avoid traveling in China for business during, or around the Chinese New Year period, if possible, as mass migration and extended business closures mean that this period is simply not conducive to getting much done. In addition, Chinese New Year is seen as a time for Chinese people to return home and spend time with family and not many people will be taking meetings or attending work during this time. However, if a visit to China around this time of year is imperative, travelers should take precautions to ensure that travel and accommodation arrangements are made well in advance. It can often be difficult to get around China during Chinese New Year, as certain days will be concentrated with high levels of migration, while other days will see streets completely empty and all businesses temporarily closed. Many factories, businesses, banks, and schools will be closed leading up to the festival. 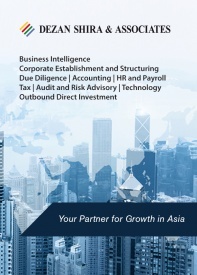 The business implications of Chinese New Year do not end on the eighth day of the holiday. While the festival comes to a close, it often takes some time for things to fully return to normal again. 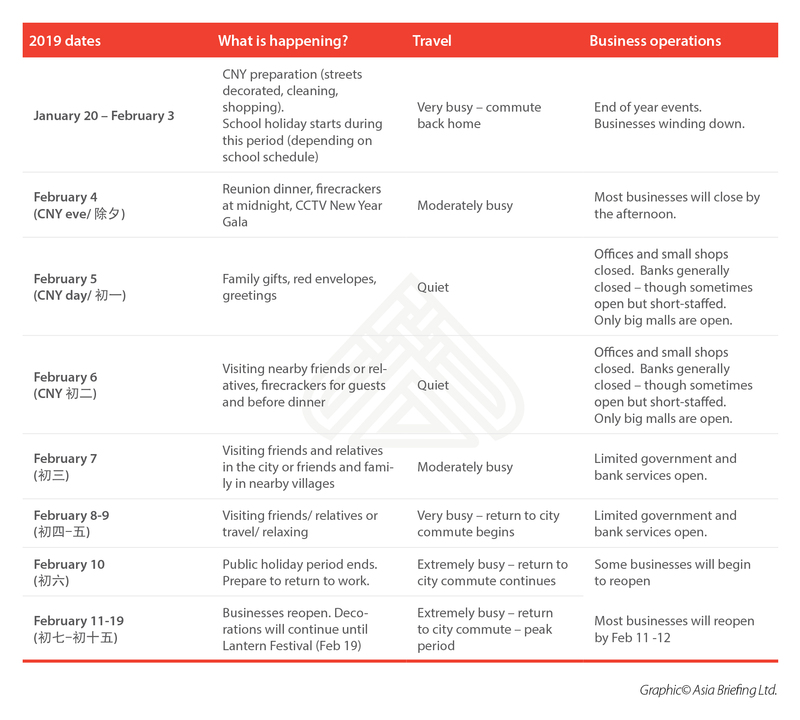 It is important to be aware that the effects of Chinese New Year will be felt long before February 5 as firms will begin to wind down their business a week or so prior to the first day of the festival. In order to ensure that business operations are not adversely affected, inventory managers should ensure they obtain a detailed schedule of opening and closing dates well in advance of the Chinese New Year and order enough stock to see their business through the holiday period. Foreign companies should also bear in mind that the Lunar New Year public holiday is one of the year’s biggest shopping festivals, comparable to the Christmas season in many overseas markets. In many consumer goods industries, businesses achieve their highest sales figures around the Lunar New Year. “Foreign companies should prepare for a surge in demand at this time of the year, and appropriately stock up their China warehouses to ensure the rise in consumption is met in a timely and orderly fashion,” Minot explains. Meanwhile, as pre-festival production is increased to fill the ‘new year gap’, and pressure on suppliers rise, the quality of products can often suffer. Issues in product quality control can sometimes spillover after the holiday period as high employee turnover requires new workers to be found and trained to replace those that didn’t return – meaning that delays are also possible. To avoid this, it is advisable to increase monitoring and communication in the months leading up to, and after, the holidays in order to minimize any potential lapses. Similar bottlenecks can occur in the shipping or logistics industries, so it is important to ensure that shipments are booked and at port well in advance of the shipment date. Most Chinese port areas will be closed completely or will be operating at a limited capacity, so they are best avoided as much as possible at this time. During this period of the year, most aspects of Chinese logistics are faced with a staff shortage as people return home, and thus transporting goods can also become significantly more expensive. To add to these difficulties, during the week-long holiday no payments can be processed to and from China or Hong Kong. Often the most suitable course of action is to settle all payments before Chinese New Year, to avoid any potential problems with late payment fees. Communicating with suppliers and planning ahead will go a long way to ensuring that effects on cash flow are minimized as far as possible. Red packets, or ‘hongbao’ in Mandarin and ‘lai see’ in Cantonese, are commonly given during the Chinese New Year Period. The significance of these red packets are the red envelopes themselves, which are seen to symbolize energy, happiness, and good luck. Therefore, when a red envelope is given, this is seen as sending good wishes, happiness, and luck to the receiver. Traditionally, if you have started earning an income, you should be giving red packets to close family members that are unmarried and younger than you or retirees. However, this is a general rule only, and there is no hard-and-fast rule on who to give a red packet to as well as how much to give. In Chinese companies, however, red envelopes are often given as a form of a 13th month salary — through issuing double pay in January, issuing a bonus over the Chinese New Year or via WeChat red envelopes. This is typically given on the last day of the working day before the Chinese New Year holiday. 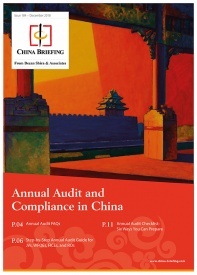 Any company doing business in China should be prepared to adopt local practices over this festive period. 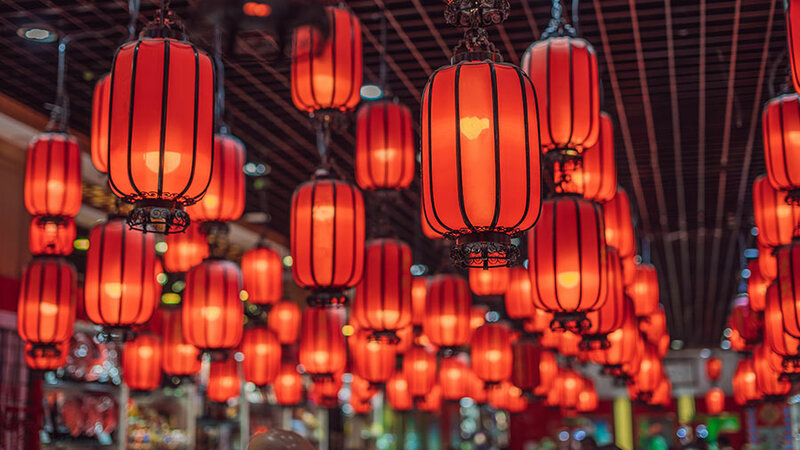 Chinese New Year is a significant time of the year for not only individuals and families, but also businesses in China, as it is often a time to re-group, re-strategize and re-staff for the upcoming year. Planning in advance for this festival can help set your company apart from the rest, reducing significant problems in supply chain and traveling logistics, while also maximizing opportunities that the festival can bring to your business.